In a massive fire outbreak at a 17 storeyed building in Surat that acts as a textile market, goods of Rs 300-400 crore are estimated to have been damaged, which houses 300 offices of textile traders and makers. The fire, believed to be caused by short circuit, broke out at 9 am on Thursday at ‘Orchid’ textile market on the Parbat Patiya Road of Surat. A relatively new building, the ‘Orchid’ houses around 300 textile traders and manufacturers’ offices, prominent of which was Vipul Fashions that manufactures and trades sarees and dress materials. 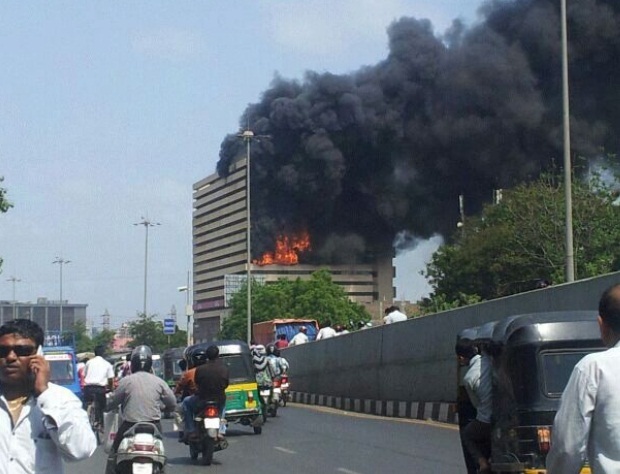 According to Manoj Kumar Das, municipal commissioner of Surat, while no injuries or casualties were reported, 90 per cent of the fire had been brought under control by 1 pm. Around 30 fire and emergency services personnel along with 35 vehicles and 3 hydraulic fire extinguishers were in action. Sources said that fire fighting equipment from nearby industrial establishments such as Essar’s Hazira plant had also been sought for by fire and emergency services officials. “The building mostly acts as a godown for textile traders. Each of the unit could be storing textile goods worth Rs 30-40 lakh. There are around such 300 units in that building. Hence, the damage is estimated to be anywhere between Rs 300 crore and Rs 400 crore,” said a textile trader member of the Federation of Surat Textile Traders’ Association (FOSTTA). The fire outbreak at Orchid building occurred exactly a day after a meeting held by FOSTTA along with Surat Municipal Corporation (SMC) wherein the building was given a 15 days period to install fire and safety measures. The meeting was held with a view to decide future course of action for imparting fire and emergency services training to security personnel at all the textile markets in Surat. According to fire and emergency services officials at SMC, this is the third such fire outbreak in the town in the last 15 days. “Usually, such incidents increase during summer season due to extreme heat,” the official added. However, industry sources said that there are 156 such textile markets with each housing around 200 units. “With so many textile markets, it is very unlikely for a standalone fire incident to impact the industry’s day-to-day functioning,” the FOSTTA member added.